In the minutes after the game got away from them, in the hours that the Magic ebbed from their beings, all the players of the Tampa Bay Bucs could do was to question why this one got away. Interceptions and fumbles, penalties and defensive lapses. In all, there were just too many errors that will lead to too many flashbacks. This one just got away from the Bucs. The winning streak, and the mojo that came along with it, ended late Monday night when the Bucs dropped a 30-27 decision to the Pittsburgh Steelers. It was a disappointment that will leave the Bucs wincing in pain at their own errors. Certainly, there were a lot of them. -- Quarterback Ryan Fitzpatrick, who had a lot of Tampa Bay's fans wearing fake beards, threw three interceptions, and one of those was returned for a touchdown. Fitzpatrick still finished with a 400-yard game, but he also threw three straight incompletions on the Bucs' final offensive drive of the night. -- Wide receiver Chris Godwin fumbled after a first-down reception in the second quarter. He later dropped a pass in the end zone. -- The Bucs had a horrible night of tackling, including whiffing on a 75-yard scoring pass and a 27-yard scoring pass by Steelers' quarterback Ben Roethlisberger. -- The Bucs failed twice with first-and-goal situations inside the 10, settling for field goals both times. -- Jason Pierre-Paul twice was called for roughing the passer penalties. -- After DeSean Jackson returned a punt 83-yards for an apparent touchdown midway through the fourth period, safety Isaiah Johnson was called for holding. The Bucs took over on their own 7-yard line, in essence a 93-yard penalty. -- After the Bucs decided not to go for a first down at their own 20, Pittsburgh was able to run the final 2:36 of the game (with two time-outs and a penalty) off the clock. -- The Bucs gave up three sacks. -- The secondary once again was porous, as Ben Roethlisberger hit 30 of 38 passes for 353 yards. 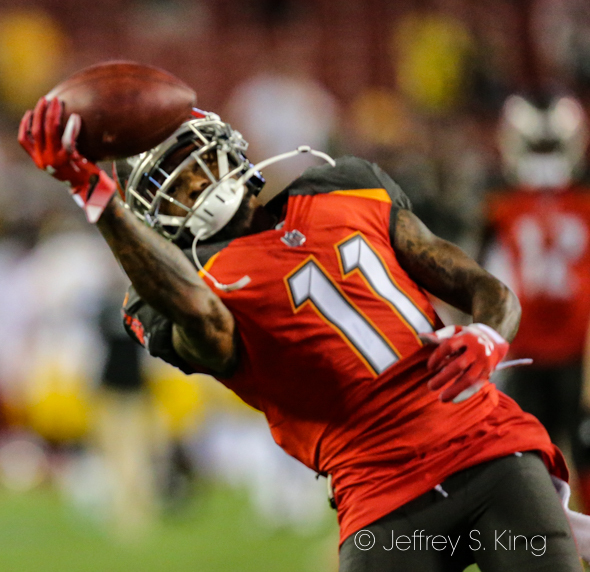 In three games, the Bucs have given up 102 of 131 pass attempts and eight touchdowns. And, despite it all, Tampa Bay came back in the second half to come within three points. That was better than folding up after a first-half in which they were outscored by 20, but it also brought a level of frustration with it. wavering and no blinking. Having the feeling that we were going to come back and win the game." There is something to that, and yes, there is something to the way the Bucs sputtered as they fell behind. But wide receiver Mike Evans defended Fitzpatrick. One of his interceptions was batted at the line, and on another one, Evans said he ran the wrong route. Still, the Bucs made an alarming amout of mistakes, most of them in the first half. "We just did so many things in the first half that we haven't been doing, so many things to beat ourselves," Bucs' coach Dirk Koetter said. "We had a blown coverage on their first touchdown. Three turnovers. Multiple misses on protection. We gave ourselves a chance there at the end and just couldn't pull it off. "I thought our defense in the second half was really good. Carlton Davis played a hell of game in coverage. We had decent pressure." The Bucs shut the Steelers out in the second half. After allowing 284 yards in the first half, they allowed 129 in the second. Instead of 14 first downs, they gave up eight Instead of 257 yards passing by Ben Roethlisberger, they allowed 94. "I'm happy with the way the first two games went," Fitzpatrick said. "I'n not happy with the way that I turned the ball over or the way I didn't finish that fourth-quarter drive. For our defense to give us that opportunity and not to make anything of it...that's what hurts the most." The Bucs now face a decision. Usual starting quarterback Jameis Winston returns from suspension, but how can the Bucs bench a quarterback with three straight 400-yard days and 11 touchdowns? "We'll see," Koetter said. "Let's see what the injury report comes back. Any time we have these games, it's not always obvious how the players are going to com in the next day and Wednesday. Let's see what happens. I'd love to get a chance to talk to Jameis before I tell the rest of the world." Koetter didn't blame Fitzpatrick for Monday night. Koetter said there was consideration over going for their final fourth down, but in the end, the team decided to punt. "Obviously, the lower (the down-and-distance) gets, the higher your percentage," Koetter said. "On fourth-and-10, you're talking about 20 percent or less odds. It would be one thing if you had no timeouts." Still, you can quibble with the call. The Bucs' defense hasn't made a lot of timely stops this season. To ask them to do it against the Steelers might have been too much. There were 22 penalties in the game, 13 by the Steelers and nine by the Bucs. There was also a play where Chris Godwin caught a ball, rolled over and ran 56 yards for the touchdown. However, it was ruled that he was touched down on the play. The Bucs now travel to Chicago to face the resurgent Bears next Sunday. 2-1 is pretty darn good against the quality of opponents they had. Fitz made a really bad throw for that pic 6 but the other interceptions weren’t all his fault. I agree with you that Fitz should remain the QB for the Chicago game if not even beyond that depending how it goes on Sunday. Eventually, the bucs will turn to Winston. Too much money invested in him. But not yet. I am disappointed but not devastated. This team is finally looking like a real solid team..not just a bunch of uniforms. There seems to be a group personality emerging and I am not sure if Winston can fit in right now. Koetter has a tough call to make! With a short week and a road game, you stick with Fitz for now. Winston’s time will come.